Brinkman Adventures is a radio drama series geared toward real life mission accounts. The Brinkman family through their church has several encounters with missionaries and the stories that they share. 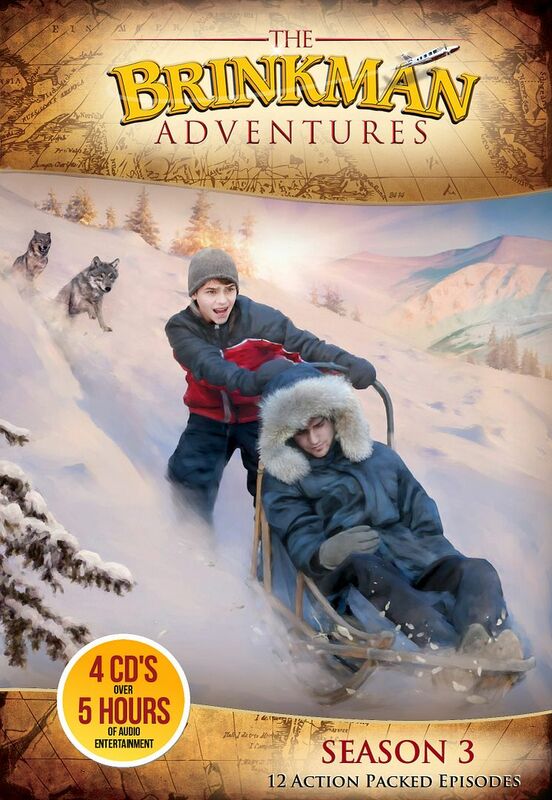 We jumped in with The Brinkman Adventures: Season 3, haven't heard any of the series prior. We had not problem picking up in season 3 with the story line at all. I had seen it come through the review circuit last year and we opted out because of time restraints. This year when we first stuck in the first CD in the car on the way to co-op, I was impressed immediately and thought "We need to get the first two seasons!" We have been trying to include missionary stories in our weekly curriculum. We study a country and then include a missionary in it. With these, I can't really align specific missionaries to countries, but that is ok. I am able to expose the kids to current missionaries, rather than just past ones who have had books written about them. I love after we listen to the episode, we can go to the website and hear the real story to get additional information. They will tell you there what things were true to the actual event and what they may have added for your listening pleasure. Some of these missionaries have to have their names changed and picture blocked out to keep them safe as they continue their work. I really thought this hit home with the kids to read about them as actual people. There are 12 episodes on 4 CD's for 5 hours of listening. We loved listening in the car when we were driving to our co-op class about half hour away. We were able to get through an entire episode on the way there, and another on the way back. The Brinkman series is very well done. It is not 'low budget' or 'cheesy' at all! I know that sounds bad, but really you need to know that these are done at a high caliber and your entire family will enjoy them and be sitting on the edge of their seat waiting to hear if the missionary is caught, or hurt, or is able to fulfill his/her mission. I have always loved the visual of the family sitting around the old fashioned radio, listening to the episode for the night. Having their hot tea, and popcorn, all together gathered around and listening. I have desired that for my own family, but just haven't seen it happen. I can visualize turning off the TV for one night a week, and listening to the Brinkman Adventures and then talking about the episode together and sharing our hearts. Doesn't that sound utopic? The CD's can be incorporated into your school day as well. How about lunch time? While you all sit together and eat lunch and take a 'break', you are still putting in great character and information into your little ones by learning about missionaries. You can also incorporate them into a mission studies class. After you listen to the episode, and see the real story you can look up the country and maybe even find out more information on the specific missionary (if their name hasn't been changed). Many options for utilizing this CD collection into your school day as well as just for fun. I think we will be getting season 1 and 2 for under the Christmas tree.. shhh! See what my Crew mates thought of this radio drama by clicking on the link below.